Theresa May's newly appointed ministers must open a dialogue with the marketing industries right away in order to protect the UK's competitiveness, agency and brand leaders have said. Chris Hirst, Havas’ European and UK group chief executive, said the risks posed by Brexit made it imperative for the government and industry to work together. "We need to protect the free movement of talent from all over the world and send the right message that the UK is still open for business – and, as creative leaders, we are ready and willing to play our part," he said. 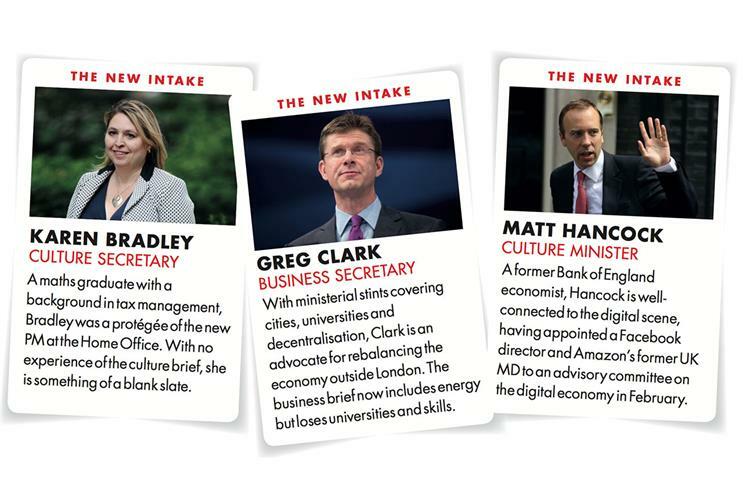 As part of an extensive reshuffle, May promoted Home Office minister Karen Bradley to the cabinet as culture secretary, while communities secretary Greg Clark became business secretary. Former Cabinet Office minister Matt Hancock, meanwhile, succeeded culture minister Ed Vaizey, who had held the role for six years. Cilla Snowball, group chairman and group chief executive of Abbott Mead Vickers BBDO, said she hopes the new minsters "engage with us individually and collectively to help drive collaboration". The overhauled cabinet could result in changes to David Cameron’s long-delayed obesity strategy, and Tim Rycroft, director of corporate affairs at the Food and Drink Federation, urged May’s team to work with industry on the policy. "During this period of massive business un-certainty, any measures which cause real difficulty to industry without making a difference to obesity would be unwelcome," Rycroft said. The body represents the biggest food brands. IPA president Tom Knox said that while he was sorry to see Vaizey leave, Hancock was a promising choice with a "really good appreciation of the contribution of the creative services", thanks to his previous brief that oversaw the Government Communication Service. Knox said that he felt ministers had "really listened" to the concerns of the industry after the previous government advertising framework in 2012 drew heavy criticism. There was a mixed response to the appointment of Bradley, who has no previous experience of the culture, media and sport brief, with Scott Knox, managing director of the Marketing Agencies Association, criticising the choice of a chartered accountant for the role. But Jonathan Trimble, chief executive of 18 Feet & Rising, said that while it suggested culture, media and sport was a low priority for May, Bradley’s appointment was a "move for stability over strong views" and that an "accountant’s view may not be the worst thing". One of the key issues facing Bradley will be the future of Channel 4, which has been considered for privatisation. Ian Twinn, director of public affairs at ISBA, said: "We like Channel 4 because it gets ads to people who are quite hard to reach normally – so we wouldn’t want to see a massive turnaround."